A column of water shoots into the air after a torpedo from a Grumman TBM Avenger from the US Navy's Task Force 38 strikes IJN Shokaku. In October 1944 she was the flagship of Admiral Jisaburo Ozawa's decoy Northern Force in Operation Shō-1. On October 25, 1944 she took part in the Battle of Cape Engaño. She launched her remaining aircraft in an ineffective strike against the U.S. 3rd Fleet: most were shot down by the American covering patrols, but a few stragglers made it safely to Luzon. 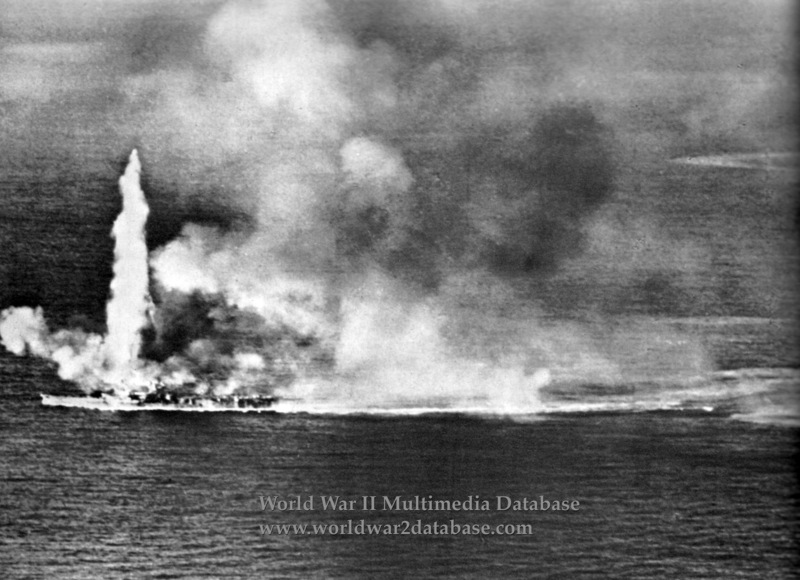 Then she came under heavy air attack and was hit by seven torpedoes and nine bombs. With Zuikaku listing heavily to port, Ozawa shifted his flag to IJN Oyodo. The order to abandon ship was issued at 1358 Hours and the flag was struck. Zuikaku rolled over and sank 210 miles northeast of Luzon at 1414, taking Captain Kaizuka Takeo and 842 men with her. 862 men were rescued by IJN Wakatsuki and IJN Kuwa.